Facet syndrome or the facet joint pain | joimax Inc. In our aging societies back pain disorders are widespread and frequently occurring. The differential diagnosis of the facet syndrome (or facet joint syndrome, facet joint pain) is even more common as compared to other frequently diagnosed back pain causes. Man researchers think of It as a potentially leading cause of cervical (upper-back and neck) and lumbar (lower back) pain. Left untreated, chronic back pain can become a debilitating condition, preventing patients from completing daily life and work tasks. Because the pieces of the spine are interdependent in their function, injury or illness in any one area can cause irritation and eventually injury and illness in other areas. Accurate diagnosis, treatment, and rehabilitation are key to managing the pain caused by the disease and, ideally, preventing the condition from causing a further deterioration of spine health. Each section of the spine is made up of two facet joints and a disc, these function together to facilitate movement in every direction. Nerve paths run through these joints on their way from the spine. Healthy facet joints are cushioned with cartilage and lubricated with synovial fluid. Facet syndrome is not a clearly defined disease. As the name implies, the symptoms originate in the small intervertebral joints – the facet joints. These facet joints are under constant motion and allow the spine the flexibility and stability that we need to walk, run, bend, and so on. They are well-nerved and are subject to degenerative processes as an element of the spine. Such degenerative processes can cause a progressive deterioration of the cartilage surrounding the facet joints, as well as a reduction in the lubrication provided by synovial fluid. Eventually, this results in bone rubbing on bone and subsequently bone spurs, increased pain, and/or a reduction in spinal flexibility can occur. 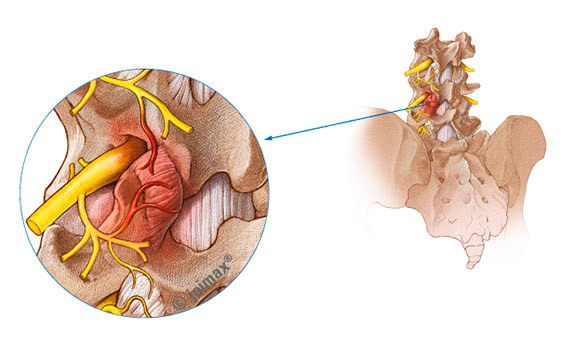 Bone spurs can press into nerves, causing substantial discomfort, and if they become large enough they can expand into the spinal canal causing it to narrow (this is known as spinal stenosis). It is estimated that facet joints are to blame for back pain in about 15% of younger patients and in up to 40% of the older patients. The facet joints bear a large share of the static load on the spine, but they are subject to even more stress with movements – especially when bending or twisting. There are degenerative processes, such as those described above, in the facets similar to those in other joints of the body and therefore osteoarthritis may develop. It may occur as a result of the natural spinal aging process, an accidental injury including whiplash or overuse due to sports or heavy labor at a young age. In addition, the facet joints’ damage may stem also from excessive weight or family history of facet syndrome. Further risk factors include the presence of gout, other infection, or arthritis. Firstly, patients may have a painful feeling in their neck or back that disappears and comes back at each time after overuse. Eventually, in the progress of the disease, the pain lasts longer and comes out more frequently. At first, only one joint may be affected, but if the patient keeps doing their usual activity, after a certain time more facet joints may degenerate as well. A further characteristic symptom is dull pain in the lumbar spine, which usually largely varies in its intensity. It may radiate also into the buttocks, the legs, pelvic area, thighs, or into the groin. Other symptoms – depending on where the affected joint is located – may include neck pain that radiates into the arms, shoulders or head, frequent headaches at the base of the skull or weakness in the legs or arms. Some patients experience aching behind the eyes and/or ringing in the ears. In general, most patients have persistent point tenderness over the irritated, inflamed facet joints and some degree of loss of flexibility in the spinal muscle. The symptoms, thus, resemble those of a herniated disc. In contrast to the slipped disc, the pain cannot be allocated to a specific nerve root or an associated dermatome. As a result, this is sometimes called “pseudoradicular” pain. Pseudoradicular pain is that which may not be attributable to actual nerve damage but is rather thought to be caused by stimulation of the nerves. Since the pain does not originate from a specific nerve, it can be difficult for the brain to determine the source of the pain, which provides some context in understanding why the pain can manifest in different ways in different patients. Often, patients with facet syndrome experience increased pain in the mornings and in the evenings; some may notice an increase in pain when the weather changes. Standing for long periods can also exacerbate symptoms, as well as excessive sitting. Thus, patients with jobs or routines that involve repetitive physical movements or positions – such as restaurant servers, truck drivers, or office employees – may be especially likely to experience worsening symptoms. The symptoms caused by cervical or lumbar facet syndrome can resemble those caused by a herniated disc, a torn muscle, a serious abdominal problem, a fracture, or an internal infection. In order to properly treat and alleviate symptoms, it is imperative that a thorough differential diagnosis be performed. Diagnosis begins with a clinical interview in which the patient’s complete medical history and presenting symptoms are discussed. During this visit, a physician may perform a physical examination to look for curvature or other visible abnormalities in the spine. Additionally, they may palpate the areas surrounding the facet joints to note any tenderness. X-rays, CT scans, MRIs, and electro-diagnosis may also be used to attempt to more definitively locate the source of the pain and spot any signs of deterioration of the facet joints. A diagnosis of can be confirmed by the administration of a diagnostic block. During this procedure, medication is injected into or near the nerves in the facet joint. If patients experience at least a 50% reduction in pain, the test is considered positive and a diagnosis of facet syndrome may be given. Essential to successful treatment is an accurate expert diagnosis so that the correct source of the pain can be determined. Once the diagnosis is made, in mild cases often a temporary administration of pain medication or muscle relaxants and a structured and individualized strengthening program will help the patient. Balancing rest with varied physical activity, for example, may help to alleviate the stress on the joints while also strengthening the surrounding supporting muscles. If this therapy is not successful, a treatment with minimally invasive procedures can be considered. Here, the pain-causing nerve fibres are either directly flooded with analgesics or completely disrupted with radio frequency.